Landscape painter. Son of william Collingwood R.W.S. (1819-1903). Studied under his father and later went to University College, Oxford, where he met Ruskin. Then studied at the Slade School in London under Legros. Exhibited at the principal London galleries from 1880, mainly at the R.A., R.I. and Sufolk Street. 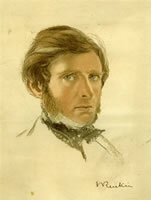 In 1881 he became Ruskin's secretary at Coniston. He married Miss E. M. D. Isaac in 1883 and removed to Windermere. Very interested in geology, also certain aspects of ancient history, and was President of the Cumberland and Westmoreland Antiquarian Society. He was a founder member of the Lake Artists Society 1904 and President from 1922 until his death. Apart from his work in England, he also painted in Switzerland and Italy, and was fond of working from a gret height, looking down on his subjects. Author of several books, including Life of Ruskin and Lake District History. Died on 1st October 1932 at Coniston.